Please submit your question below. Md. Washington Minority Companies Association © 2019 All rights reserved. The material and images on this site may not be reproduced, distributed, transmitted, cached or otherwise used, except with prior written permission. 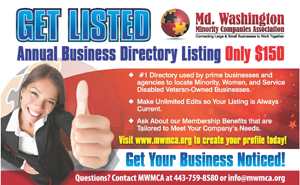 PLEASE NOTE: This website and MWMCA's previous website design and content cannot be duplicated or copied.